Another day begins for the Kona coffee farmer. While cardinals start their song and morning breezes flow down from Mauna Loa (elevation 13,333 feet), the farmer grabs a cup of his best brew and walks out the door into history. 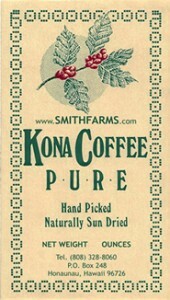 Kona coffee refers to coffee that is grown only in the North and South Districts of Kona on Hawaii island . These Kona Districts cover an area of about 20 miles long and 2 miles wide, on the west coast of the island. The North Kona area is on the slopes of Mt. Hualalai, while South Kona is on the slopes of Mauna Loa. 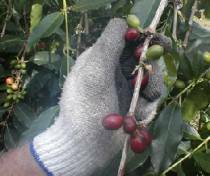 At last count, there were fewer than 600 farms growing coffee in the Kona Districts. While there are several farms over 65 acres each, the majority are much smaller and average about 5 acres. Only these farms produce Kona coffee. Coffee that is grown on other parts of the island or on other islands within the Hawaiian Chain may not call their product Kona coffee. Kona Coffee, a Coffea arabica -var. typica, is generally acknowledged as one of the two most highly valued coffees in the world and it was brought, in 1829, to Hawaii island by missionary and teacher Samuel Ruggles. 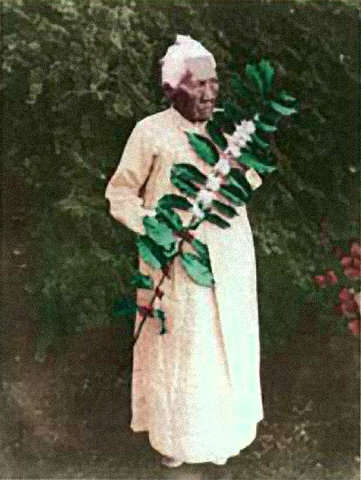 “Wilkinson (Boki’s English agriculturist) efforts were more fruitful than Marin’s and he successfully established a coffee orchard..in Manoa. Coffee immediately thrived in the optimum weather pattern of mauka Kona, where sunny mornings and an afternoon cloud cover continue to be the norm. Kona’s wet summer and dry winter is the exact climate the Coffea arabica plant prefers. Initially, coffee was simply consumed locally or sold to passing whaling ships. In 1845 the first exports to California began an industry! The early years of the Kona Coffee market were exciting. Farmers were encouraged by landowners to begin coffee farms, although some early land leases to the farmers, demanded as much as half the crop in payment. In 1900 however, the final tariff for sugar cane shipped from Hawaii to the United States was removed, and the development of new sugar cane lands was enthusiastically encouraged by Territory of Hawaii administrators. Coffee was quickly relegated to a secondary position and some acreage was even plowed under. Although the original farmers in 1893 were Japanese contract coffee laborers brought directly from Japan to work coffee, no coffee plantation begun in the late 1890s was financially successful. Surviving the mercurial nature of the marketplace was and continues to be difficult for Kona coffee. – In 1999 (and in 2002), for example, the price for a pound of green coffee is about $11/lb. – In 1898, the price for a pound of green was $0.158 /lb. A 1918 frost in Brazil, the world’s largest coffee producer, caused the price of green Kona to rise to $0.28/lb., but the 1929 US Depression caused the prices to fall again. By 1940, the price of a pound of green Kona was down to only $0.08/lb. Insect pests and other organisms were also problems. A US Department of Agriculture report published in 1974, cautioned that only 11 percent of the full-time Kona coffee farmers were under 55 years old and the report also suggested that the coffee industry was in jeopardy of dying out. It was simply impossible to be full-time farmers of Kona coffee and make ends meet because of unstable prices, and it was the older, more settled group who could afford full time farming. Over twenty years later, thanks to farmer determination, a loyal following and the natural tenacity of the plant, Kona coffee cultivation has a more varied mix of farmers and the crop is in demand. Many people seeking alternate lifestyles during the 1970s, discovered the pleasures of Kona and the farming life, eventually purchasing land leases and this mix of real individuals now thrive as Kona coffee farmers. Some current farmers are former university agriculture graduates who worked for large agribusinesses and found there was too much politics and not enough agriculture in what they were doing. Many more recent farmers wanted a simpler life. There are also continuing multi-generational families of Japanese, Filipinos, Portuguese, Hawaiians and Caucasians, who continue to enjoy the family farm life as a Kona coffee farmer. According to the Hawaiian Experiment Station- Bulletin #66, published in 1932, “with the exception of land rental and fertilizer, the entire cost of coffee as it is sold to the mill…is represented in hand labor.” Nothing has changed and that formidable amount of “hand labor” contributes to the high value and excellent quality placed on the taste of Kona Coffee. Once picked, coffee is off to the mill. The assortment of farm vehicles found at the pulping mill is indeed colorful with WWII Jeeps, trusty and rusty 4 X 4’s with non-functioning odometers/license plates and the occasional newer pickup truck. Sometimes only a single bag emerges from the trunk of the family car. At the pulping mill, the skin of the coffee bean is pulped off and the beans are soaked in water to remove the sugary pulp or mucilage still adhering to the coffee bean. The processing, known as wet fermentation takes from 12-36 hours to accomplish. The coffee beans are then washed clear with pure volcanic aquifer water- some of the purest water in the world and now the beans will be dried to the parchment stage. For best results, the beans are laid out on the hoshidana *( above- ground drying platforms) so that Kona’s warm sun and gentle breezes will dry the precious beans to the correct moisture level. The drying beans are watched closely and raked often for uniform drying. The hoshidana is cleverly constructed so that at the first sign of a rain shower, a roof can be quickly drawn over the entire platform, protecting the beans. Some processors elect to use forced hot air in large containers to speed up the drying beans, and many purists claim they can actually taste the difference between sun-dried and kiln-dried. The connoisseur avers that the sun dried beans maintain more of the delicate mellow flavor associated with Kona’s coffee. This is the *parchment* stage which had followed follows the *cherry* stage. Most coffee is kept stored at the parchment level. When a farmer needs green coffee, he takes his parchment bags to the green or dry miller and the coffee beans then have their outer skin or parchment removed. Next the beans can be graded according to size and defects, or kept in an “Estate Grade”, and they can also be State of Hawaii Certified as to Origin and Grade by Hawaii Agriculture Inspectors. Green coffee may be stored in a climate controlled atmosphere for up to a year. Some experts claim the flavor is enhanced by storage while others say fresh is best. When a farmer wants a roast, he takes his green coffee to the roaster and gets it roasted and …..twenty-five pounds of green results in about 20 pounds of dark roasted whole beans. Work continues on the coffee farm during the non-harvest season as well. From March through September, the Kona coffee farmer carefully cultivates his crop. Pruning off the older, less productive branches in the spring, allows the new shoots to begin their growth cycle. The farmer must also fertilize his many hundreds of coffee trees. Three other very important jobs happen during this period. The farmer must visually anticipate and carefully select the most promising shoots from each coffee tree for the next few year’s production. This is quite a science and can make the difference in crop production. The new growth of early summer needs to be pared down to produce future efficient yields. Rats need to be actively discouraged from eating the sweet mature beans. Weed control in the lush and fertile summer fields needs to be constantly managed. Simply said, a well-cultivated coffee tree has a far greater yield than a wild one. Much of the mauka Kona coffee acreage has been continuously cultivated since the Hawaiians first farmed the lands in prehistoric Hawaii (pre -1778). Stone walls built by the agricultural Hawaiians to farm their own food crops, still remain on much on the land. In many cases a bulldozer or tractor has never touched or compacted the coffee land and the volcanic and organic soil remains porous which is what Kona coffee enjoys most. Despite the year round labor, Kona coffee farmers love what they do and feel privileged to be able to work outdoors in the extremely pleasant subtropical Kona climate cultivating a product that is famous among coffee drinking societies through out the world. The entire Districts of North and South Kona remain beautiful in no small part because of the lush green slopes covered in old growth coffee- some farms made up of trees over 100 years old.